CORPUS CHRISTI, TX – Looking for a structured sport for your young child that will introduce team play that is also fun? 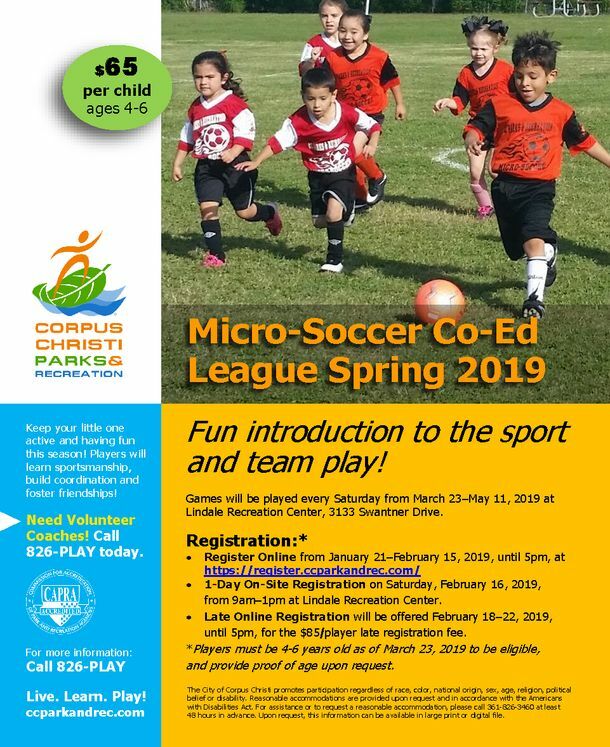 The Corpus Christi Parks & Recreation Department will be offering its Spring 2019 Micro-Soccer Co-Ed Youth League for ages 4-6. This recreational league utilizes a modified field size with a focus on fun and basic soccer concepts. Games will be played during an eight-week season every Saturday from March 23 – May 11, 2019, at Lindale Recreation Center. The cost is only $65 per player! REGISTER ONLINE now through 5pm on February 15, 2109, at https://register.ccparkandrec.com/. ON-SITE REGISTRATION will be held on Saturday, February 16, 2019, from 9am–1pm at Lindale Recreation Center, located at 3133 Swantner Drive. LATE ONLINE REGISTRATION will be accepted February 18-22, 2019, until 5pm with the late registration fee of $85 per player. Applicants are required to provide proof of age upon request. Volunteer coaches are needed! For more information, call (361) 286-PLAY (7529), between 9am–4pm, Monday–Friday.